Whole-cell patch clamp recordings of neuronal activity in vivo exhibit signal quality sufficient to report synaptic and ion channel-mediated subthreshold events of importance for understanding neural processing during normal as well as drug-mediated behavior. Recently, we developed a prototype "autopatching" robot  that enables automated whole-cell patch clamp recording of neurons in a living mouse brain. While automation of the in-vivo patch clamping process opens up the possibility of multi-channel in vivo electrophysiology, scaling up the current system would dramatically increase system cost and complexity. Specifically, the current autopatching algorithm relies on several discrete pieces of hardware such as an amplifier, headstage and digitizer--as well as commercial software to communicate with the equipment and perform electrophysiology. We will present an automated, in-vivo, whole cell electrophysiology suite that consists of a four-channel microchip-based patch clamp amplifier  and software that dramatically simplifies the setup necessary for traditional automated patch clamping. This system (Figure 1A) eliminates the need for the conventional amplifier, digitizer, headstage, and data acquisition board to effectively combine the high-throughput nature of the autopatcher  with the voltage and current clamp toolsets available in commercial software packages. 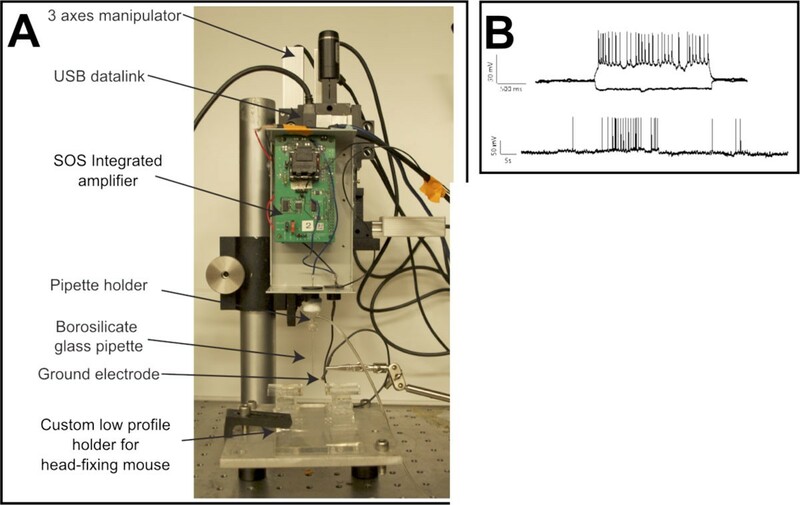 Un-automated in vivo whole-cell recordings have already been demonstrated using a single-channel microchip-based patch clamp amplifier with conventional pCLAMP software (Molecular Devices, Sunnyvale, CA; Figure 1B). Preliminary results indicate that our simpler, multi-channel electrophysiology suite can perform computations required for automatic neuron detection, leading to successful whole-cell patches. We will report progress toward total automated integration and incorporation of electrophysiology tools into the software suite. The total cost required for the patch chip and the electrophysiology software suite should be several orders of magnitude less than that of conventional systems, and far simpler to handle, integrate with existing rigs, and use. (A) Single-channel patch chip amplifier in the patch clamping setup. (B) Representative in vivo whole-cell recordings in current clamp mode using conventional pCLAMP software and the patch chip. Ilya Kolb, Gregory Holst and Craig R Forest contributed equally to this work.